Spearmint Tea – Spearmint Leaf Tea Spearmint (Mentha spicata)is one of the most common edible plants of the mint family. Spearmint is often used in cold drinks and juleps and to impart a delicate aroma to fruit salads, meats, new potatoes, peas, jelly, vinegar and sauces. In addition to many traditional culinary uses for Spearmint, ingenious cooks have created some unusual delicacies. For example, Indians in New England would roast mint leaves, then salt and eat them. They would also dry their meats in layers with mint leaves in between. Cosmetically, Spearmint can be used as a soothing bath herb, an ingredient for facial steams, and as an astringent for gently cleaning oily skin. Spearmint possesses properties similar to Peppermint, but it is milder and more fragrant and is usually preferred over peppermint by children. 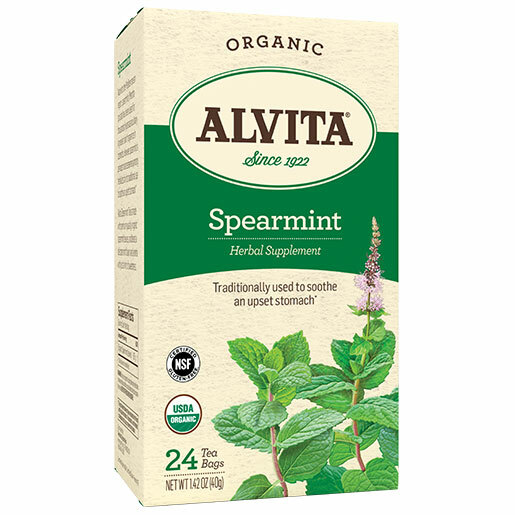 About Alvita Tea Since 1922, Alvita has been making the finest herb teas money can buy, natural singles and blends that bring you unsurpassed enjoyment, healthful benefits and complete satisfaction. No less reassuring is our unwavering commitment to the environment. Today, no herb tea company goes as far to protect the Earth and its precious resources-this package and its contents being testimony. There is no plastic shrinkwrap on the outside. The box is 100% recycled board that can be recycled again. The finish is soybean-based. Our tea bags are English Pillow Style, with no strings, tags or staples attached. Even the tea bag paper is recyclable. And all our bags are oxygen bleached, not chlorine bleached, to safeguard you and our ground water. Degradable. Recyclable. Reusable. The key component of each is the word able . At Alvita, we wholeheartedly believe we are all able to play a key role in preserving the wondrous world we live in. For us, it starts with offering you the most environmentally safe and responsible herb teas possible. Alvita. Natural herb teas that are good for you and the environment. Ingredients: Spearmint leaf (mentha spicata). Caffeine Free. Directions: The best way to make a good tasting cup of tea is by the infusion method. Place one tea bag into a cup and add no more than 6 oz. of boiling water. Let steep for 3 minutes and remove the bag. Press the bag before removing to enhance the flavor. Add honey to sweeten. This entry was posted on Wednesday, May 17th, 2006 at 12:01 am and is filed under Healthy Teas. You can follow any responses to this entry through the RSS 2.0 feed. You can leave a response, or trackback from your own site.